It's noon at the office on a Friday and a friend just texted you saying they feel adventurous. You can see the heat radiate from the pavement on your commute home. You feel spontaneous and think back to your younger years when travel was more straightforward and unplanned. Last-minute travel works when you're not set on particular comforts or destinations and maybe you can make it a road trip? Or take the train? No matter how you get there, it's time to escape to the cooling lakes, wide open fields and star-filled skies of Ontario resorts. Just pack your toothbrush and load Google Maps on your phone. An all-inclusive resort like Bayview Wildwood is an ideal destination for spontaneous get-up-and-go adventures. Just pack a change of clothes and head for the shores of Sparrow Lake. If you arrive early enough you can enjoy dinner on arrival and the resort will take care of the next morning's breakfast too, no need to worry about meal planning or the dishes. While there's plenty to do for the whole family on the resort grounds, its location between the lake and the Canadian Shield affords visitors a number of local opportunities for exploration. After you've had a good night's sleep in your large comfortable Bayview Wildwood bed you can use the resort as home base as you trek around the surrounding Ontario wilderness. The Muskoka Wharf and Trail in Gravenhurst has 2km of mulch-based pathway extending along the peninsula that also happens to be stroller-friendly. Over 3000 acres of wetlands full of raptors and reptiles await you at the Wye Marsh Nature Centre. Get a buzz on with beekeeping lessons and visit the observation tower. The world's first dark sky preserve is located a short distance from the resort in the Torrance Barrens Conservation Area. Marked by an absence of light pollution, this remarkable spot is perfect for enjoying the view of the natural surroundings and appreciating the intricacies of a starry sky. Surrounded by protected and undeveloped land, the preserve offers unobscured views of celestial lights in all their radiance. Maybe you can time your next quick trip in conjunction with a meteor shower and gaze at falling stars from one of the most idyllic stargazing destinations in Canada. If you remembered to pack your camera and a tripod, you can even try your hand at night photography. So many summer nights are best enjoyed out on a patio with a glass of wine and a salty snack within arm's reach. But maybe it's time to switch up the old routine and make a quick trip to Blue Mountain resort where you can explore the local wine scene by way of kayak, canoe, bike, or even helicopter. Visitors can relax in the world-class amenities of the resort and explore the local wineries or if you prefer, breweries. Instead of your back deck you can paddle down the Beaver River like a pioneer in search of fermented treasures until you arrive at Georgian Hills winery. A Georgian Hills wine tasting experience will feature wines exclusive to the region including Baked Apple Dessert Wine, Frozen to the Core Dessert Wine and yes, cheese. A European-style cycling journey, the Pedal Paddle Adventure is a self-guided 40km quest that transports your bike by gondola to the lush rolling hills of apple orchards. After traversing the winding hills by bike you'll rest your legs on the one hour paddle portion on the Beaver River in your choice of watercraft. After kayaking, hiking, biking, and drinking your way through the surrounding landscape you'll retire to Blue Mountain's private beach on the shores of Georgian Bay. Change rooms and towel service mean you only have to bring your bathing suit. 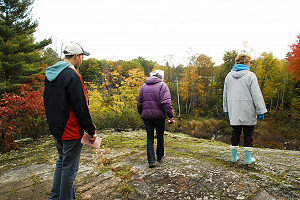 You can also use Blue Mountain as home base as you explore Ontario's hidden treasures with a mountaintop Segway tour. 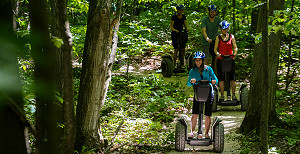 A trained guide will school you on the finer points of operating the two-wheeled Segway as you explore the wooded terrain on this off-road survey of the Niagara Escarpment and take in views of Georgian Bay. The Escarpment is also home to many glacier-carved caves and guided tours provide directions, helmets and headlamps. If you've ever been in traffic staring at the back of the car ahead, fantasizing about riding a jet ski and seeing the froth of a motor boat in front of you, Fern Resort has the perfect waterfront to fulfill your summer escape fantasies. Another all-inclusive getaway, the resort will look after everything on your spontaneous last-minute trip. Quick getaways don't always have to be action-packed and this family-friendly resort offers plenty of frills that don't require you to break a sweat. Grab some putters and go for the next hole-in-one playing mini-putt with the kids or grab the latest in guilty pleasure reading (romance? thriller?) and find a comfortable beach chair in the shade as the kids are supervised in the resort's Playvillage activity program. Since all meals and activities are included, you don't have to reach for your wallet or think about your credit card balance. Fern Resort will let you escape in every way. If your last minute trip does include a craving for adrenaline, challenge your travel companions to a spirited game of paintball. You'll get fresh air and exercise on the rainbow-splattered battlefield of Fern Resort's paintball range. 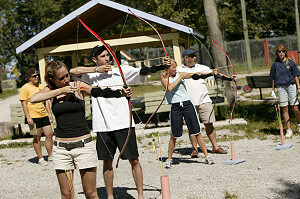 Alternately scale the heights of the climbing wall or practice your aim at the archery range. If rest, relaxation and a little incense are more your style, the spa at Fern has skilled practitioners of Reiki, head massage and reflexology ready to melt the stress away. If it's warm enough all these services will be offered lakeside. Why not go camping on your last minute adventure? The Algonquin Log Cabin is even better than that, offering guided canoe treks and wilderness hikes with your own dedicated guide. Whether you want a calm canoe trip through the morning mist or to traverse white rapids, you can end your day in front of the lodge fireplace or sipping a beer on the dock. And while camping is great, the lodge beds are definitely softer and more cozy than any sleeping bag. 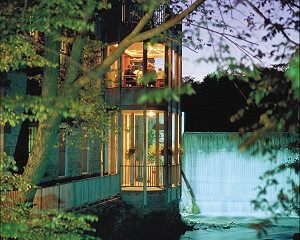 Elmhirst's Resort lets you escape to the shores of Rice Lake and its sprawling, scenic grounds. Get back to nature in this environmentally sustainable resort which has enough space on the property to raise chickens, cows, ducks and turkeys as well as plenty of herbs and veggies in their vibrant gardens. Wine and dine in the Hearthside Dining Room or rejuvenate sore and tired muscles in the full-service spa surrounded by the ambiance of the natural agrarian surroundings. Whether you're looking to play or unwind, the Millcroft Inn has got you covered. Located near Caledon, Ontario's horse country, you can cheer on Olympic hopefuls at the Equestrian Park or take a trail ride by renting a horse from one of the stables. 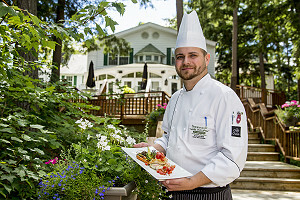 Hike the Bruce Trail or bike the Cataract Trailway then return to the resort in the evening where he Headwaters Restaurant provides a feast for the senses. There are two bonfire pits and the resort staff will be happy to start the fire for you and provide blankets to help you stay cozy. Whether you're roaring through the forest on your own ATV with a Bear Claw Tour, sightseeing from up above with Georgian Bay Airways, or cruising on the Idyllwood yacht taking in an unforgettable Muskoka sunset, the historic Sherwood Inn will be your temporary home in between adventures. Enjoy a unique culinary experience and fresh local produce in the Vintages Dining Room and sample their creative collection of wines from around the world. This rustic lodge in the midst of Kawartha Highlands Provincial Park will serve as your last minute holiday oasis. The park is the second-largest in Ontario and the inn is located along a quarter mile of scenic shoreline, featuring a private sandy beach and an inground pool for the swimmers. Nearby villages like Lakefield and Tragically Hip-inspiring Bobcaygeon are paradise for antiques, country stores and fairs. Traverse the white water rapids of Burleigh Falls with a rented kayak or simply take in the manicured grounds and extensive perennial gardens at your own pace. Sometimes the city is loud and muggy and you can't remember the last time you saw the stars. You might not have the time or money to fly to a faraway destination but there's no reason you can't enjoy summer to the fullest with a last minute getaway or weekend trek off the beaten path in an Ontario resort. There are weekends and summer nights just begging for a spontaneous journey. These last minute trips will help you make the most of summer before it's over.